﻿﻿﻿﻿Wildscaping can turn your lawn into a beautiful home for wildlife. ﻿﻿﻿﻿﻿﻿﻿﻿﻿﻿﻿Did you know that a whopping 32 million acres of land is devoted to the growth of manicured, watered and fertilized grass across the nation? That’s a lawn larger than the entire state of Mississippi. Most of the grasses used in lawns aren’t native to the area where they are grown. Since that exotic lawn replaces native grasses, wildflowers, shrubs and trees, wildlife must search for ever-shrinking habitat. People are healthier and happier when they spend more time with nature, and watching wildlife is fun for people of any age. So, how can we invite butterflies, birds, lizards and frogs back into our lives while still keeping the area we live beautiful? Wildscaping is the process of creating a landscape that’s designed for the benefit of both wildlife and humans. A wildscape may look just like a regular landscape, but it includes native plants that provide nectar, pollen, leaves, nuts and berries that desirable native wildlife can eat. Wildscapers also enhance habitat for native and beneficial insects, which act as pollinators, nutrient recyclers and even food for other wildlife. A wildscape provides elements of habitat — food, water, shelter and space — for desirable wildlife. To get started, take it step by step. Step 1: Take stock. Sketch out your area. Include the hardscape (sidewalks, buildings, etc.) and plants you currently have. Make notes about the conditions as well as the land uses within your area. For example, make note of areas that currently serve as walkways, even if there’s no sidewalk. Indicate north and south, and areas that stay more wet or dry. Note drainage patterns, problem areas and places with a view or plant grouping you especially like. Step 2: Make goals. With all the stakeholders present, agree on a set of goals for your habitat. Be sure to include play areas, specific wildlife areas (areas for birds, areas for butterflies) and travel corridors. Step 3: Evaluate. Take a look at your current layout and see which parts might fit in well with your goals and which might need to be removed. You can evaluate plants based on their invasiveness, region of origin and value to local wildlife. Step 4: Conceptualize. Based on the first three steps, create a basic sketch for your wildscape. You should include large ovals and irregular shapes that outline areas you want to designate for bird watching, garden paths or butterfly gardens. There should be no specific new plant species noted on this sketch. Step 5: Plan. Consider your concept sketch piece by piece, noting the functions of the plants required for each area. For instance, in a butterfly walkway area you’ll want plants that attract adult butterflies, plants that serve as larval (caterpillar) host plants, plants whose bloom times overlap, flowers that are short (near paths) and taller (behind them), etc. Choose plants that will fulfill those functions, and sketch them out on an aerial view map. 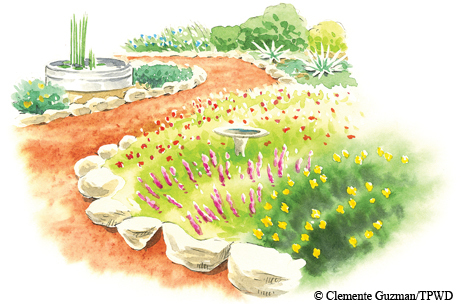 Don’t forget to include other habitat and people-friendly elements, such as unmortared rock walls (good for lizards) and benches (good for weary people). For help selecting plants by characteristic, get a copy of Texas Wildscapes: Gardening for Wildlife (now with searchable DVD) or use the online Native Plant Database from the Lady Bird Johnson Wildflower Center (www.wildflower.org/collections). Step 6: Act. With a good plan in hand, you can implement your wildscape in stages as the seasons (and your budget) allow. Evaluate your successes and challenges, and then modify your plan accordingly. By including all the elements of habitat, you can turn a water-hungry lawn into a verdant habitat teeming with butterflies, hummingbirds and happy people.